One rainy October afternoon I was taken on a tour of Dublin Institute of Technology (DIT) Bolton Street and its sister building Linenhall across the road, whetting my appetite to see this frequently referenced institution. 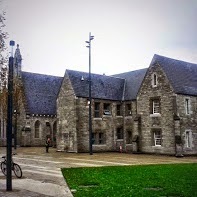 DIT Bolton Street was purpose built for technical education almost a century ago in 1911. As a visitor it is an illegible labyrinth of corridors; a disorientating warren of lecture rooms and offices making the best of the footprint it occupied. 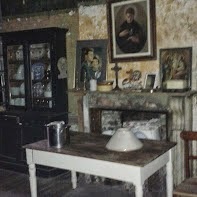 Its students and staff in conditions seemingly as cramped as the nearby Georgian townhouses were in their tenement reincarnation. 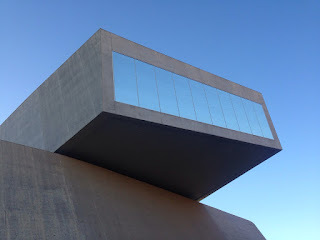 My next stop on my architectural sightseeing would contrast greatly with Bolton Street; DIT’s new campus in Grangegorman, a 73 acre undeveloped walled off void in north central centre. On the way us flâneurs took a little detour to a secluded cul-de-sac. This urban oasis was created by Henrietta Street and King’s Inns only minutes from Trinity College, Smithfield and Heuston Station. Not another soul was on the street. I associate my childhood with a leafy suburban cul-de-sac; an overriding sense of security along with the constant surveillance. This ‘dead end’ was an escape for me from the traffic and noise of the city. Its cobbled street transported me back in time to Georgian Dublin. Having grown up in Limerick city this architectural language was familiar to me but with larger proportions. I am ashamed to say I studied this area of Dublin in great detail but never paid her visit. My life then as a stream of dashes from Heuston Station to Belfield UCD. As I began to rhapsodize about the timeless beauty of this hidden Georgian neighbourhood a man pushing his bicycle emerged out of No.12. My guide in his North Kerry boldness asked simply “can we go in?” To my surprise we were and so began my Georgian afternoon daydream. Henrietta Street consists of a terrace of Georgian red brick- fronted four-bay, four-storeyed townhouses. The keeper who granted us cheeky tourists entry was a very friendly American chap who told us about how the building these days is used as a location for many television and film productions. Apparently during the previous week the building had opened its door to none other than Josh Hartnett and Eva Green! Henrietta Street is considered to be one of the first and finest planned Georgian Streets in Dublin. It was developed in the early 1720s by Luke Gardiner (more on him in my previous post). Thirteen of the original fifteen houses remain today. 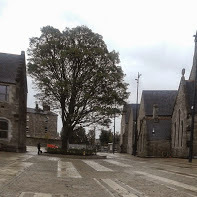 The street was popularly referred to as Primate's Hill as one of the houses was owned by the Archbishop of Armagh. No.12 had her face cloaked by a veil created by the scaffolding outside. Only inside could you admire her beauty. No.12 had a twin sister; she was built as a pair to No.11 between 1730 and 1733 designed by the architect Edward Lovett Pearce, the hand behind Castletown House. Lovett Pearce was also responsible for No.9. Some of the greatest structural modifications to No.12 occurred from 1780 onwards when Richard Boyle, the 2nd Earl of Shannon, decided to amalgamate the pair of buildings in order to create one vast town residence for himself. This radically altered the internal plan of both houses, while completely transforming the external appearance of No.12. The two houses were later separated after the death of Shannon in 1807. It is ironic that this building that did not seem large enough to accommodate Boyle would become a tenement to multiple families. 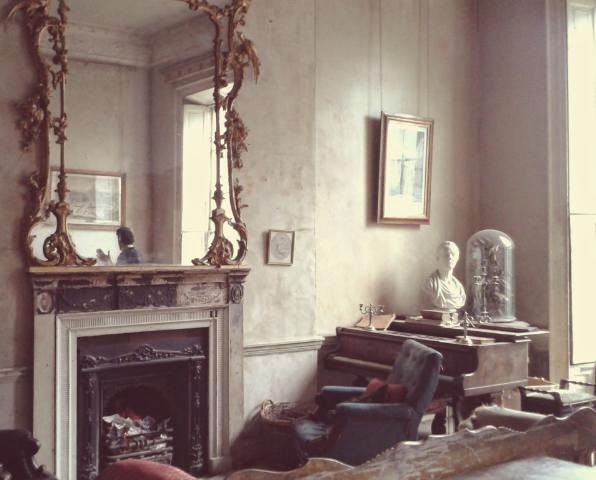 As you would expect with a property of this age not many original period features remain intact. However with a little imagination you can see how grand and commanding she once. was What I love most about No.12 is her honesty baring the evidence of the past 300 years. Inside the door we were met with a sparsely furnished hall with a staircase that invited you to ascend it. 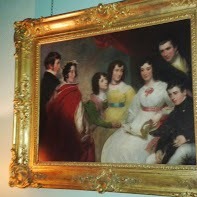 At the top of the first flight I turned right and was cheerfully greeted with a wonderfully bright drawing room. Light delightfully bounced around the high-ceilinged room through the windows. The daylight in here was somehow different to the contemporary buildings I was in earlier that day. 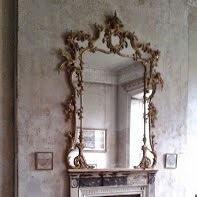 The walls were bare save for a very large ornate gold Louis XV style mirror over the fireplace. 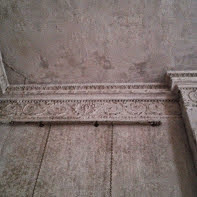 The craftsmanship of the internal joinery of the window shutters, the cornicing and Neo-classical plasterwork were all exquisite. It was almost impossible to conceive the idea that it was created by human hands. Standing speechless in that drawing room I was almost afraid to breathe in case this Georgian mirage would dissipate and turn to dust. I could not tell you how long I spent in there as I was lost in a state of enchantment, completely under the spell of Number 12. We were two ghosts floating round the room. I had studied the development of Dublin as streets however it was now the fun part of honing in on one particularly building; one which may look like her neighbours but has her own distinct history and personality. On returning home I went into detective/jealous girlfriend mode researching her previous owners and the changes they made. Where did you come from? Who were the people who loved you before I knew you? Did they appreciate you? What are your future prospects? ﻿﻿﻿﻿﻿﻿Dotted around this impressive site is a complex of former institutions which would have originally been on the outskirts of the city. Their hardness is softened by the beginnings of the landscaping and the retention of mature trees. Retaining the older stone buildings alongside the new builds gives the place a sense of permanence and endurance. It is wonderful that their previous uses can be embraced and not hidden away. I doubt that would have happened thirty, twenty years ago. The most prominent building on the site is the former Richmond Penitentiary with its striking clock tower. 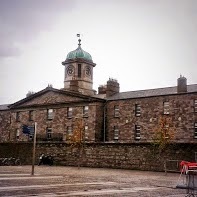 It was designed by Francis Johnston (architect of the GPO) and opened in 1820. The penitentiary propagated the radical idea of reform rather than punishment until its closure in 1831. Richmond Lunatic Asylum (which later became St Brendan’s Hospital) is historically the main psychiatric hospital serving the greater Dublin region. The new buildings will create a sweep of quadrangles like an arm wrapped around the limestone 18th century buildings. These pockets of spaces, places for chance-encounters, are connected by slinky serpentine pathways. There are 11 protected structures in total on the campus including a former asylum and two churches, one of which will remain as a place of worship on the campus. The re-use of these buildings on the Grangegorman site reflect our change in perception in mental health history in this country. These institutions once hidden away behind high walls on the outskirts of the city are now integrated within a permeable campus for everyone to enjoy. Likewise Georgian townhouses in the fifties and sixties were neglected being resented for their colonial origins. While the architectural and historical importance of Henrietta Street is recognised by many, the general awareness of Henrietta Street is quite poor in contrast to other area of Georgian Dublin such as Merrion and Fitzwilliam Squares. With the relocation of DIT to Grangegorman it is likely that the near future will see continued physical change in the area and this will impact on the character of Henrietta Street. Buildings adjust and change through time bowing to socio-economic forces, land values and the ebb and flow of the construction industry. Aided by historical context it is feasible for our collective viewpoints to adapt as easily as these urban landscapes.